Why does changing the text for a TextView using the setText method not work sometimes? 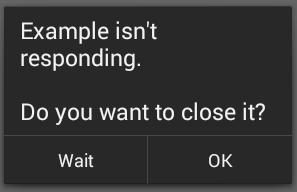 New Android developers sometimes fail to understand why changing the text does not appear to work. The text not updating also applies to other Views as well, such as the EditText and Button. Why this happens is explained in this article. This tutorial is also useful in helping to understand why the User Interface (UI) in your Android app might not be as responsive as expected. The underlying problem is the same. So if you are trying to find out why setText() on EditText, TextView, Button, etc. is not working as intended, or you UI is sluggish, then read on. The example source code includes a work around to help you out. For the above Java effectively creates an anonymous object and casts it as a TextView object. For those new to programming the above is equivalent to the following two lines but saves having to declare the TextView object. When setText("New Text") is run the text is not updated immediately. 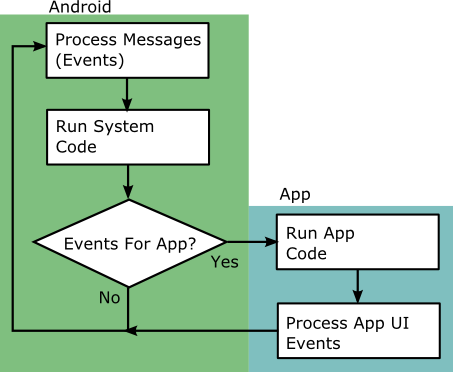 Android is an event based system. Something happens on the device (the screen is touched, a key is pressed, a call comes in, etc.) and Android raises an event. An app is notified of an event and responds to it if required, often running the code that has been written. The app runs its code in a loop under the control of the Android Operating Systems (OS). This code loop is referred to as the app's thread of execution. There is only one thread and it is responsible for both running the app code and updating the display. The setText call posts a message to update the display, so the update does not happen immediately. Once remaining app code has run the UI messages are processed. It is then that the text changes. 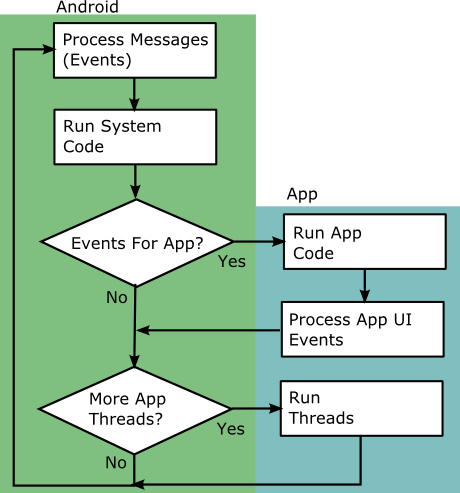 A running app's execution thread can be viewed as shown in this simplified diagram. What happens is that the Finished message is seen but the progress messages are not. If the UI is prevented from updating for more than about five seconds then what is known as an ANR (Application Not Responding) error occurs. The user may think the app has crashed completely and force close it, and then probably remove it from the device. Humans can detect systems responding down to tens of milliseconds, at about one tenth of a second pauses begin to degrade the experience of using a program. If no feedback is given for a few seconds users can become annoyed. It is easy to get the no response error with the above code, increase the number for the test in the if statement from six to twelve, if(++number_processed>12), run the app and hit the Button several times. Android has a built in class to make running intensive code easy, the AsyncTask, it is covered in the Tek Eye tutorial article The Android AsyncTask Class Helps Avoid ANRs. Whenever a section of code is going to take some time to execute, maybe a second or more, then the use of AsyncTask is recommended. However, it can appear overkill when all you want to do is update a TextView to provide feedback before executing some code that may take a second or two. A prime number is any number that can be divided by itself and the number one, so the sequence begins 2, 3, 5, 7, 11, 13, 17, 19, 23, etc. and goes on for infinity. Routines to perform a primality test are well established and are usually based upon the Sieve of Eratosthenes.This function was derived from the script at Prime Curios! Primality Test web page. For most numbers the routine executes extremely quickly, however, a long integer can have up to 19 digits. If a 19 digit number is a prime then the inner loop can run several million times and a long pause in the program occurs. Here is the layout for the primality testing app. 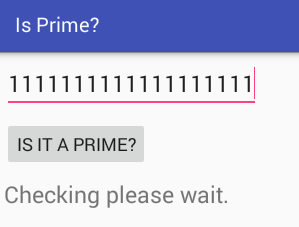 android:hint="Click 'Is It a Prime?'" 1111111111111111111 - Yes, strangely nineteen ones is a big number and a prime number as well. 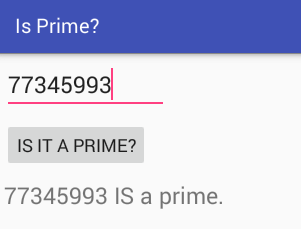 Try it in the app and notice that it takes a few seconds for the routine to determine that it is a prime number. If tv.setText("Checking please wait.") is added at the beginning of CheckPrimeClick the same problem as the sleep example occurs. The UI update is blocked by the looping code. The Handler can be newed the onCreate to use the Callback, handler = new Handler(callback). The TimerTask simply posts an empty message using the Handler. The click handler schedules the delay with timer.schedule(new SmallDelay(), 100). The result is that the UI gets the chance to update whilst the code that was previously blocking the update still executes (after being kicked off by the timer). A straightforward solution for when a quick UI update is required when code can potentially hog the main thread for a short while. Do not forget that for more complex UI feedback, including showing an active progress bar, then the AsyncTask solution is better. See the Android AsyncTask Class Helps Avoid ANRs article for an AsyncTask example. See the Android Example Projects page for more sample projects with source code. The setText call posts a message to update the display, so the update does not happen immediately. Once remaining app code has run the UI messages are processed. It is then that the text changes. Which means that, if you call setText(), a message is posted to be fulfilled WHEN CODE AFTER THE CALL IS FINISHED. So if you have code that would take a while, right after your UI updating code, like finding a prime number, or setting other views etc, the setText() call will not be fulfilled until that other code is run. Run the rest of the code after a small pause (with Handler.postDelayed() in Kotlin, or solution stated right here) or on a different thread with AsyncTask() or RxJava etc. Don't use Thread.sleep() because that won't allow the UI thread to fulfill the UI updating code, it will just halt all execution; what you want to do is to post the message to update UI (with setText() etc. ), and give the UI thread extra time to get the message, service the message request and update the UI before it has to start working on the code after the setText() call. Dan at Tek Eye in January 2018 said: Yes, exactly. Perfect comment.